House Bill 589  is not a perfect bill. It may even be distasteful, especially for progressives impatient with the pace of renewable energy development. But considering the anti-renewable tenor that has characterized the legislature for the last six years, this bill is likely as good as it gets — for now. Certainly, there are some seismic shifts in the bill — leasing solar systems finally would be legal — but the goals are modest, hardly the hallmark of a state that is among the leaders in solar energy. And the measure was fast-tracked — introduced, jammed through two committees  and on to the House floor — in just two days. “It could have been much better,” Rep. Pricey Harrison, a Guilford County Democrat, said during a full House debate. “But it does advance clean energy. There’s been a lot of compromise on the bill, and I’ll be voting yes. The bill passed the House 108-11 and now goes to the Senate. The 20-page bill is nearly indecipherable without a guide. NCPW talked with several renewable energy experts to determine how customers and potential solar energy users would be affected by the measure. I want to install a rooftop solar system. What’s in this bill for me? First, already assuming your house isn’t engulfed in shade, the cost of a solar system depends on how much sun hits your roof, the size of your home, the amount of power your family consumes, and of course, electricity rates. Unless you decide to rough it and run your home solely on solar — your home won’t have electricity when the sun doesn’t shine, so forget about playing the XBox — you will still be connected to the utility grid. Enter your home address into Google’s Project Sunroof to calculate how much sun your home receives and the amount of square footage available for solar panels. This information is derived from Google Earth’s satellite data. Project Sunroof will also run some rough cost estimates, including tax incentives, but these are highly variable. Installation on a small house — less than 1,000 square feet — can run $10,000 in upfront costs; panels on a larger home will cost a lot more. The good news is that if this bill passes and you don’t have enough upfront money for a rooftop system, you would be allowed to lease one from a solar developer or a utility. This is currently illegal. What’s the catch on the leasing agreement? One concern has environmental justice implications: A system can serve only one home; apartment buildings or other multi-family housing are excluded from lease deals. This would affect low- and moderate-income people who could benefit from lower electric bills. But the most significant shortcoming is that there is a cap of how much solar energy can be leased: 1 percent of the previous five-year average of North Carolina’s contribution to the retail price of peak demand. Without figures, that jargon doesn’t mean much, but let’s just throw out a hypothetical number, 50 megawatts. Once that amount is leased, no other customers can get in on the deal. The bill contains other restrictions on the systems. They have to be connected to the grid. Residential customers can lease no more than at 20 kilowatts, or 100 percent of the estimated demand per household. The legislature allowed the state tax credits for solar to expire in 2015. How can I get a break? The expiration of those tax credits dismayed environmental advocates and solar proponents. The rebate program in the bill is supposed to assuage those concerns. However, again, the rebates have a cap that could restrain the growth of solar. Duke Energy Carolinas and Duke Energy Progress would limit the amount of energy eligible for a rebate to 50 megawatts apiece. Non-residential systems, including nonprofits and schools, are eligible for rebates on as much as half of that energy. Assuming they used their full rebates, that leaves cost breaks for only about 1,000 homes. In South Carolina, the rebate system was quickly maxed out. The dollar amount of the state rebate isn’t laid out in the bill, but a 30 percent federal tax credit is also available. Does net metering mean Duke Energy pays me? Because I would love that. Net metering is a serious flaw in the bill. Currently, if your solar system generates more energy than your home uses, you can “sell” that power back to Duke, which will credit your bill for the equivalent dollar amount. Under the bill, Duke Energy could petition the state utilities commission to increase fees on net metering or decrease the credits. If you shifted 20 kilowatt hours back to the grid, you might not get credit for only 15 of those — or even less if Duke is allowed to add on charges. In other words, don’t quit your day job and expect to make money off your solar system. I rent, and my landlord doesn’t want to put solar on the house. Do I have options? Finally, renters and homeowners whose houses aren’t suitable for solar can access the system. Through the proposed community solar program, utilities would be required to construct up to 20 megawatts of solar facilities specifically for customer subscriptions. The problem: The 20 megawatt goal is low, considering the potential demand. Each solar facility is restricted to only 5 megawatts, a very modest amount. Under the bill, community solar has similar issues to those of net metering — customers would not get full credit for the power they sent back to the grid. Subscribers would have to live in the same county or an adjacent county to the solar facility. With permission from the utilities commission, a subscriber could live up to 75 miles from the solar facility. At least five households would have to opt in, but no one household could subscribe more to than 40 percent of the output. How will this bill affect those giant solar farms that I see all over the place? The bill also restructures contracts between the Duke Energy and large solar energy providers, and unsurprisingly, favors the utility. Currently, these contracts apply to solar providers that generate up to 5 megawatts; the agreements last for 15 years at an established price of what Duke will pay for the solar power. This creates certainty for both sides, and enables the solar developers to secure financing. HB 589, though, reduces the length of the standard contracts to 10 years, which could harm the solar providers’ financing. Solar providers that generate more than 1 megawatt would now have to compete for contracts, potentially discouraging companies from entering the market. And Duke would have control over where these farms could be built. From Duke’s viewpoint — for efficiency’s sake — geographical restrictions make sense. The most expensive part of a solar farm is the cost of the land. Acreage is cheap in eastern North Carolina, which is why so much renewable energy is being developed there. However, fewer people live in that part of the state, so the supply of energy resides in an area with less demand. Are there other reasons to cheer for this bill? 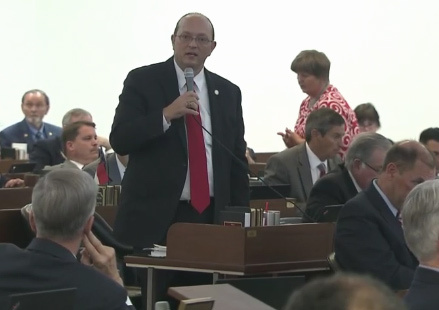 The bill also requires the NC Policy Collaboratory to study the value of energy storage. If renewable energy can be cheaply stored in batteries — the technology exists, but it’s expensive — that would help solve supply and demand issues. For example, on sunny days when the supply of solar is greater than the demand, that energy goes back to the utility grid. If Duke can’t use that power, it has to sell it, often at a loss. Storage addresses that problem.